Have you heard of the new, natural way to help relieve your dog’s (or cat’s) fear of fireworks or thunderstorms that doesn’t involve tranquilizers? If not and if your pet has problem, why not give it a try? Many of our clients from the surrounding areas of Grand Junction, Fruita, Clifton, Orchard Mesa, and Redlands rave on about how well it works, but like anything else, it doesn’t work all of the time. Our veterinarians have been told by many clients that the older their dogs get, the more fearful they become during thunderstorms and fireworks. Thus, having your dog(s) try out the ThunderShirt earlier as a puppy or in the dog's life will lead to more effective results. Experts believe that pressure has a calming effect on the nervous system, possibly by releasing a calming hormone like endorphins. Using pressure to relieve anxiety in people and animals has been a common practice for years. ThunderShirt’s patent pending design is a pressure wrap that applies a gentle, constant pressure on a dog’s torso. It effectively aids anxiety, whether it be due to separation, during travel, or because of a fear of fireworks or thunderstorms. Besides helping dogs with a fear of fireworks or thunderstorms, the ThunderShirt is also great to help with crate training, leash pulling, hyperactivity and even problem barking. 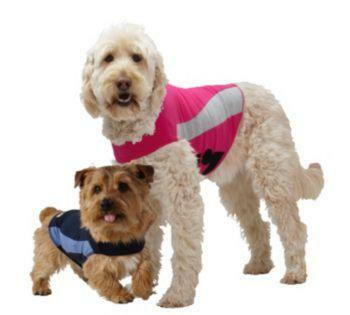 ThunderShirts come in a wide range of sizes to fit all dogs (and even cats). They are also adjustable for a custom fit. Gentle pressure over the torso has been shown to have a dramatic calming effect. Over 80% of dogs show improvement. No need for medications. Great for dogs with anxiety. Also, very useful in training. If you just google “Thundershirt,” you can find places to purchase them like pet warehouses or various online retailers. Let us know how they work for your pet if you try one.